High-quality screwdriver with a star-shaped, hexalobe head and chrome plated chrome vanadium steel blade. Comfortable, soft handle for maximum grip and power transfer. The screwdriver is one of the most common tools for household use. Together with the hammer it is an indispensable component of any tool kit. Designed for the insertion and tightening of screws, the screwdriver is a useful tool for fastening items together that can then be dismantled again later. Screwdrivers come in a variety of shapes and sizes to fit different types of screw heads. It is important that the correct size of screwdriver is used to avoid damaging the screw head. Manual screwdrivers give the user a greater feel for exactly how much torque or turning force they apply to the screw to prevent over-tightening, especially useful when assembling furniture. 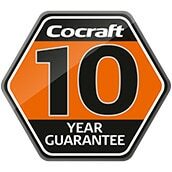 This Cocraft T screwdriver is made of high quality, durable chrome vanadium steel with a black oxidised tip. It has a comfortable, cushioned handle for maximum grip and power transfer. Make sure you use the right size of screwdriver for the screw in question so that you don't damage the screw.